Bologna’s well-preserved historic center is a perfect showcase for its stunning palaces, towers, gates, monuments, and churches. But tucked behind its picturesque porticoes and along the narrow streets and alleys that fan out from Piazza Maggiore, many ancient shops of Bologna also have tales to tell about the people and culture of the city. *Margherita Lolli, is actively involved with an organization called Bologna Connect, a non-profit whose goal is to develop and enrich connections between the region and people from other countries across the world. In this guest post for MoreTimeToTravel, Margherita graciously shares her fascinating research and insider observations on some of the ancient shops of Bologna and that still exist today. Thank you to my Facebook friend, Laura Bizzari, for introducing me to Margherita! Walking under the famous porticos of Bologna Italy, which have been designated a UNESCO World Heritage Site, you will discover many ancient shops. Bologna has a long tradition of trades and artisans working here dating back to the 1200s who were involved in the manufacture of precious metals, jewelry and holy art. In the Middle Ages, a variety of societates (in Latin) or so-called “societies” or “corporations” spread as a model of associations of workers belonging to the same work sector. The goal of these groups was to defend workers and their rights. Today, ancient shops in Bologna still have a social function. Indeed, they are a representation of Bolognese daily life and traditional trades. Many of the businesses have been handed down from father to son from one generation to the next, and have preserved their original interiors and antique furnishings, which have become historical treasures. The commercial heart of Bologna’s historic center is called the Quadrilatero (in English, the Quardrilateral). Just off the Piazza Maggiore (the city’s public square), the area derives its name from its geometric shape. Since the Middle Ages, it has housed a variety of businesses called societas, including greengrocers, delicatessens, bakeries, shops with traditional cuisine, jewelers, butchers and craftsmen. The names of streets served as a guide to the shops and stalls you would find there. For example, if you needed a goldsmith, you would go to Orefici Street; a cobbler, Calzolerie Street; keys or locks fixed, Clavature Street; fine silver, Arienti Street; anything made of paper, Cartolerie Street, and wood and cloth on Drapperie Street. Walking through the streets today, you can smell different aromas from the characteristic stalls along the path leading to “Mercato di Mezzo.” A two-story food court of sorts now sits on the footprint of the oldest medieval market, where you can taste local flavors and cuisine. When I first saw Valli, I was struck by the elegance and refinement of their fabrics. The shop offers a large variety of cotton, viscose, wool, linen, cashmere and pure silk fabrics with original designs. They have specialized in high-end fashion field since 1907. Walking from Piazza delle Mercanzie towards Piazza Maggiore, visitors are attracted by the cured meats displayed on Caprarie Street. Parma ham, salami, Culatello, Parmigiano cheese can be seen in the windows of the Tamburini. Who was Tamburini? He was president of the Salsamentari Society in 1876, which was founded to protect one of the oldest Middle Age societas, the charcuterie producers. The group’s goal was to help the workers with economic support and to promote delicatessen art. In 1932, the shop installed a pulley and track machine to move meat hanging up on hooks that was ready to be worked on and turned into charcuterie. It was a sort of pork production line and it was possible to see this system here until 1973. Now you can sit under this production gear while you taste mortadella. A Tamburini, Giovanni, still manages the store and his son, also a Tamburini works alongside him. There are many places nearby, too, where you can taste the famous tagliere, a selection of Parma ham, cooked ham, mortadella, and salami with a glass of local wine, either while having an aperitif, as you sit on an old wine cask or by visiting one of the old butcher shops. Who does not know Atti’s? Paolo Atti & Figli is a historic bakery at 6 Caprarie Street where many tourists stop to take photos of the window displays. Atti isn’t only as a bakery. It also sells some traditional dishes associated with the history of Bologna, like frittelle della nonna (a type of sweet pancake made without eggs), certosino panspeziale (a typical Christmas cake made with almonds, pine nuts, dark chocolate and candied fruit) and tortellini. Paolo Atti started the business in 1868. Later, his daughter Margherita and other brave women managed it, even during times of war and economic crisis in Bologna. 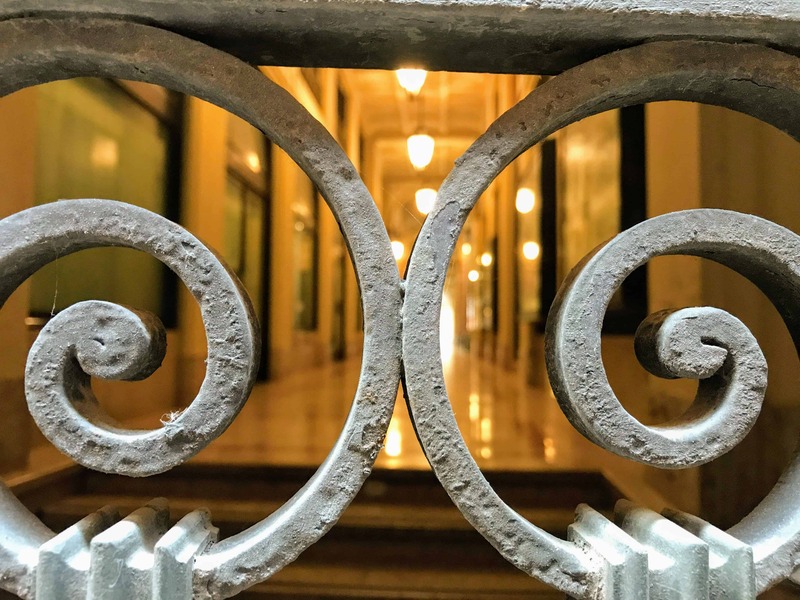 This street is dedicated to some of the most prestigious precious metal workshops such as Carobbio Jewelry that has been producing gems, pearls, and bracelets for four generations. After Carobbio’s big shop window, you’ll see an Art Deco style one belonging to Menzani Jewelers. This business opened in 1905 and I was shocked to see that it still has the original furniture on which jewelry was displayed. The merchant told me it was made by the Liporesi Company in 1935. Across the street is A.C. Vecchietti, a store that has been selling designer pens and fountain pens since the first part of the 20th century when Umberto designed his first fountain pen. He was inspired by the sculptor, Giambologna (who created the Neptune statue in Piazza Maggiore) and for this reason, he called the pen Nettuno. Some original posters of Nettuno hang on the walls. Next to Vecchietti is the shop of another prestigious jewelry brand, Giulio Veronesi, founded in 1896. Soon after, Veronesi involved his two sons in managing the business. In 1964, the jeweler’s Gemini ring won the Diamonds International Award in New York and was named the best jewelry piece in the world that year. The answer to why Bologna is called “the fat city” has to be Vecchia Malga located in Pescherie Vecchie Street. The owner, Rino Chiari, and his wife opened the shop in 1969. From the beginning, they wanted to create a new commercial network importing genuine products from local areas and selling them to the best retail shops in Bologna. Their clients increased soon, first in Modena and then at a national level. The Chiari family understood it was to recognize good quality products, you have to taste them first. For this reason, they opened a new shop, La Baita Vecchia Malga, where you can taste local charcuterie and excellent cheese. When I went there for the first time, I ate tagliere (cured meats served on a cutting board) and what I liked most was feeling the link between products and their areas of origin. Antica Aguzzeria del Cavallo is the oldest shop in the city center. It has been in business for six generations. It was opened in 1783 by Raffaele Bernagozzi who sold rifles, knives, fishing and hunting tools. The term aguzzeria is used to describe the process of making knives and sword sharper driven by working horses. On this street, you’ll discover the most ancient bookshop in Bologna. The Marchesi family opened Liberia Nanni in 1825. In 1928, Arnaldo Nanni bought it adding typical Parisian style stands of the 20s. After World War II, Nanni implemented a plan to obtain the most ancient books. Nowadays, it has become a cultural library of old books from all over the world. At 32 Galliera Street, you can discover a hat store called, Antica Cappelleria Malaguti. The business began in 1870 when the Malaguti family produced handmade hats and sold the best brands of hats to wear in all types of occasions. Here, you can find caps, berets, beanies, bowlers, and top hats—original creations made by artisans as well as bespoke ones personalized to your taste. You can also find a selection of accessories like gloves, scepters, umbrellas, suspenders, scarfs, gowns and cloaks. La Coroncina is the most ancient shop in all of Bologna. In 1694, some priests were charged with selling religious objects and they opened a sort of bazaar in the Quadrilatero district, naming it “small rosary beads.” Later, it was sold to new private owners who moved the shop into Scappi’s Tower on the city’s main street, Via Indipendenza. They started to sell a bit of everything to satisfy the requests of Bolognese people, especially during World War II, when they never closed. It is said that Vittorio Sancini, grandfather of the current owners, slept there as a night janitor watching over the shop. The Ministry of Culture named La Coroncina a “protected cultural asset”. In what was once the Jewish Ghetto, there are a number of handicraft shops that reflect the artistic and cultural heritage of Bologna. These include some goldsmiths such as the Andrea Sancini workshop, the Casagrande Tigrino company and the Guizzardi jewelry shop. These are not just craft workshops; they represent the stories of families who passed on their craft, knowledge and the secrets of their old professions from one generation to another. Then there is La Tarlatana, a manual printing shop with a historic machine for pressing and chalcography (engraving) on copper. In 1929, in Canonica Street, in the same spot where the grandfather, Adolfo, created custom-made shoes for women, stands Cosetta Corticelli. The grandfather passed his art and passion first to his son, Otello, and then his nephew, Cosetta. When you walk through the downtown historical center of Bologna, you can feel the memories of the ancient shops that remain. Some newer businesses have kept the original signage and same furnishings of years ago. For example, a sign saying, “Rizzoli International Bookshop” appears on a new clothes store on Rizzoli street. In 2004, the municipality of Bologna launched a project called Botteghe Storiche (Ancient shops) in order to empower commercial and traditional shops in the province of Bologna with economic support. Some years later, in 2011 a new project started to preserve the commercial and artisanal realty in the city center, called Botteghe di Tradizione e di Pregio (Tradition and Prestige Shops) in the Quadrilatero district. This plan has two aims for citizens and tourists: to discover the history of trade and, at the same time, to strengthen the commercial heritage of the downtown streets. This post has been lightly edited and condensed for clarity. Fabulous article, I will be there for the 3rd time in May and look forward to visiting the places I missed before. There are so many layers of things to see and do! May is a perfect time! Will have to try the charcuterie in the La Baita Vecchia Malga shop! Sounds delicious. It is one of my favorite places in Bologna. It’s always our first stop for a meal! It’s a salumeria with a restaurant on the inside balcony that overlooks the shop. The food is great! Ooh, I so want to go to Bologna. That bakery sounds amazing. Actually, all these shops sound amazing. I’m definitely going to get there someday. Maybe in 2020. Thanks for enticing me even more with these spots. Irene, you have made Bologna look so enchanting–and appetizing1 I would love to visit, Bologna, Italy. Shhhhh! Don’t tell more people about Bologna! I’m hoping Henk and I can get there before it’s as popular with visitors as Rome or Florence. (Plus I need another Italian gold bangle from one of those Orefici! Pinch me! Craig and I will be there in just a couple of weeks. This article was so helpful! I can’t wait! xxoo Thank you! Brought back happy memories of our time spent in Bologna and a strong desire to return! !